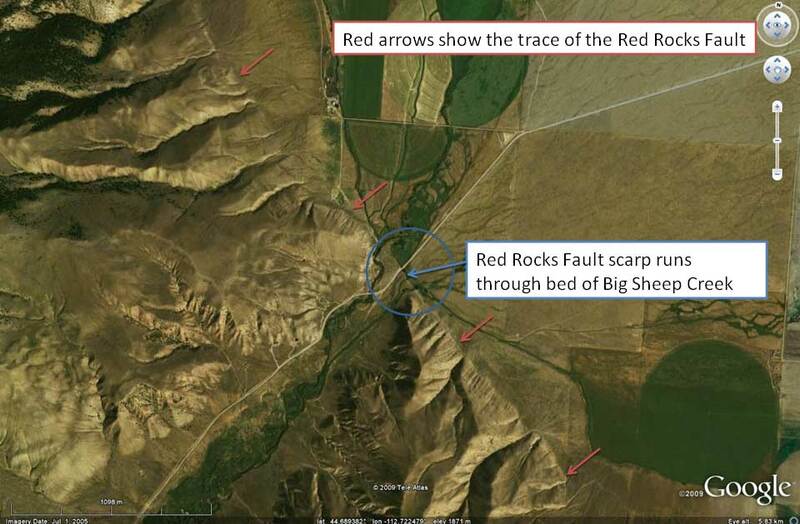 Lima Valley Fault: The Red Rock Fault is marked by a sharp line that forms the west side of the valley. 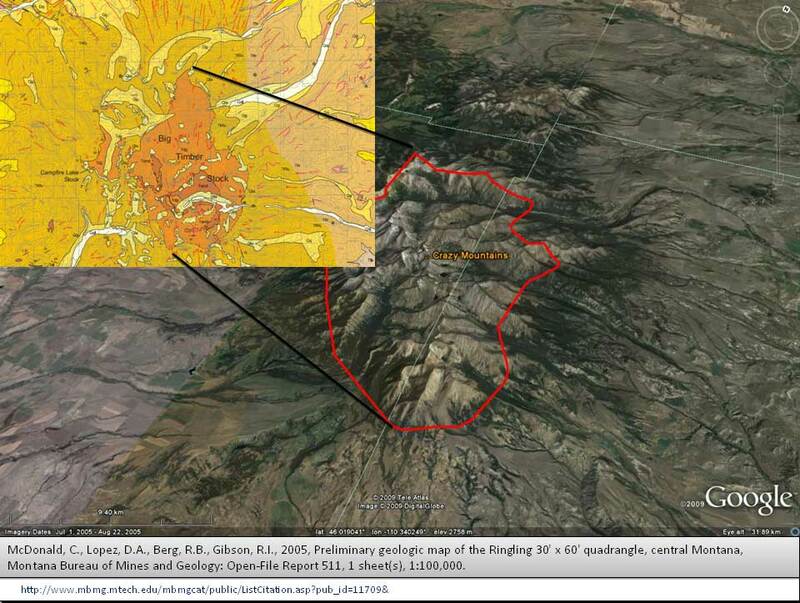 Parts of this fault have moved in geologically recent times. In this view you can see a scarp that cuts the alluvial fan of Big Sheep Creek, indicating that the fault has moved at least once since the alluvium (stream sediment) was deposited. The Red Rock Valley near Dell, Montana. 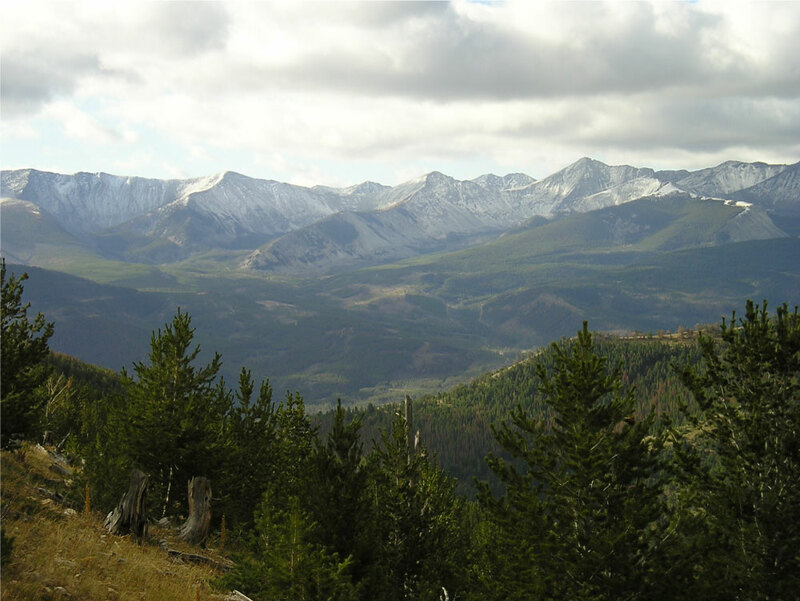 Beaverhead Mountains, Glacial Features: These U-shaped valleys and knife-edge ridges, or aretes, were carved by thick, slow-moving glaciers during the last glacial period about 18,000 years ago. Crazy Mountains: These mountains are cored by resistant igneous rock that is all that is left of a 70 million year old volcano field. The volcanic cones have been eroded away, leaving the solidified remains of a large magma chamber. If you zoom in closer to the mountain peaks, you can see that much of the erosion was done by glaciers. 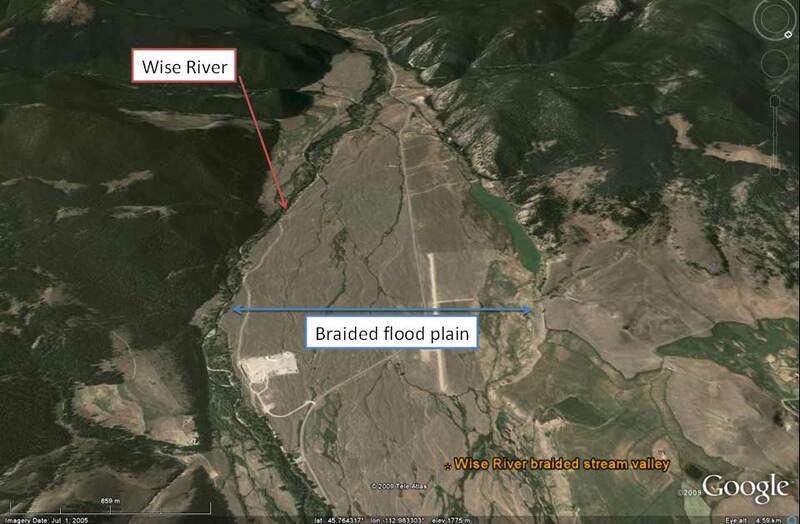 Wise River Braided-Stream Valley: The braided-looking pattern was created over a long period of time as the Wise River, now on the east side of the valley, meandered back and forth across its flood plain. This kind of stream pattern suggests that the stream had more water and a very large sediment supply at some time in the past. Melrose Abandoned Meanders: Arcuate, or curved, lines across the flood plain of the Big Hole River show where the river used to be. Meanders form where the stream bed is not very steep. 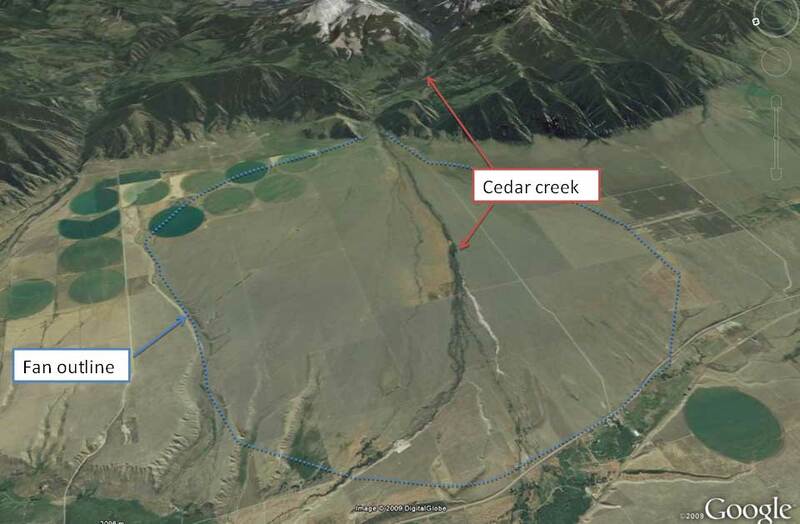 Fleecer Mountain Landslide: Hummocky topography, with low hills and rises, and pot-hole ponds are a good indicator of landslide deposits. 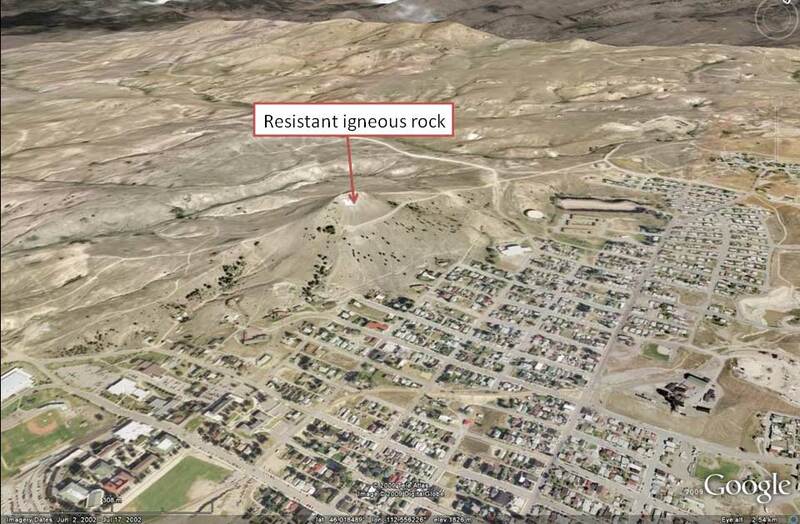 Big Butte Volcanic Neck: Big Butte was shaped by erosion rather than by deposition of volcanic material. The cone shape comes from an erosion-resistant pipe that was once a volcanic vent. Any volcanic cone that may have existed is now long eroded away. 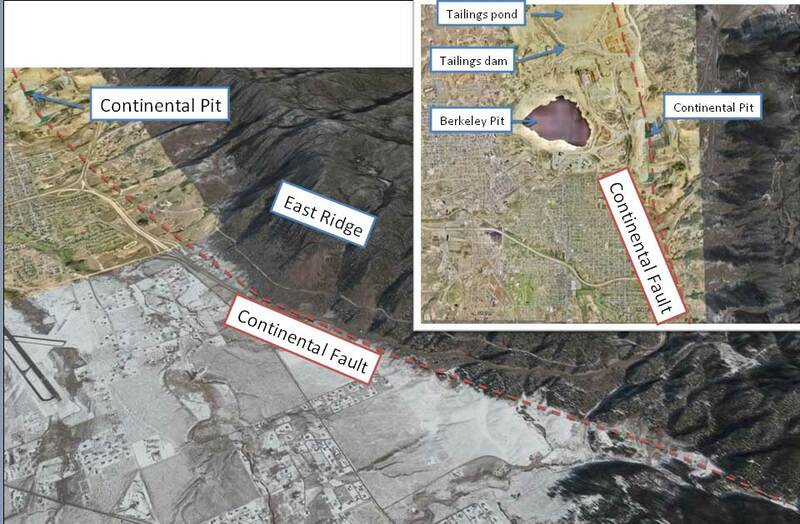 Continental Fault: The fault bounds the east side of the Butte Summit Valley and passes through the Continental Pit copper mine and beneath the Yankee Doodle tailings dam (north and west of this view). Mount Haggin Glacial Features: These U-shaped valleys and sharp, knife-edge ridges (aretes) were formed by valley glaciers about 18,000 years ago. 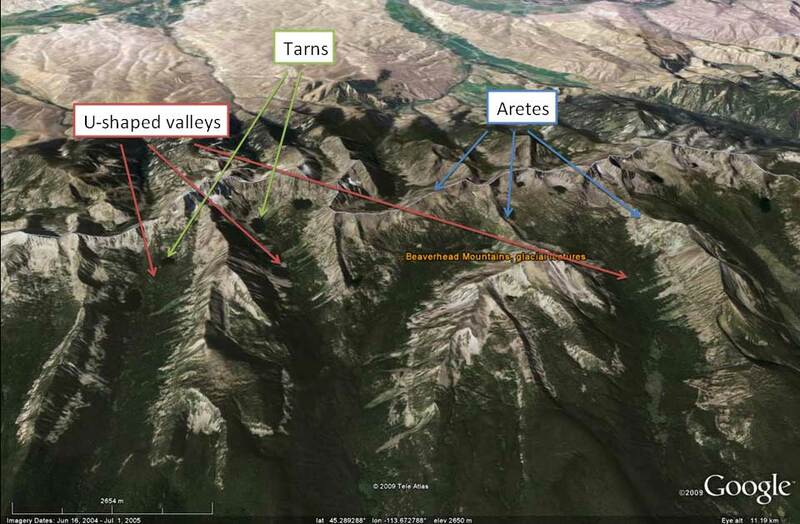 The arcuate depressions at the top of the glacial valleys are called cirques. 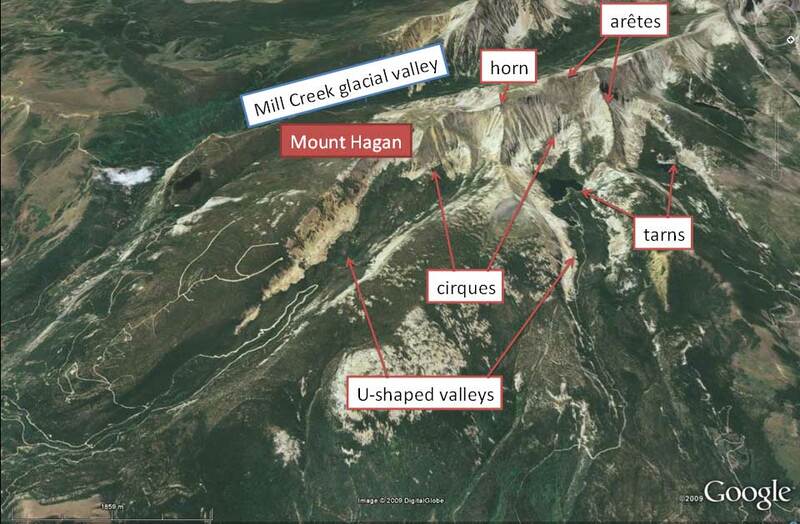 The three-sided peaks between cirques are called horns. Tarns are the lakes left in the bottoms of cirques. Mount Powell Glacial Features: These U-shaped valleys and sharp, knife-edge ridges (aretes) were formed by valley glaciers about 18,000 years ago. 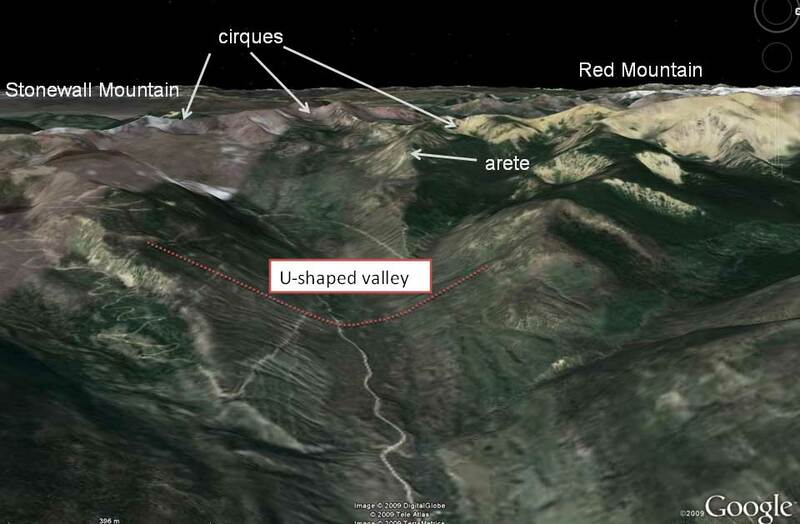 The arcuate depressions at the top of the glacial valleys are called cirques. 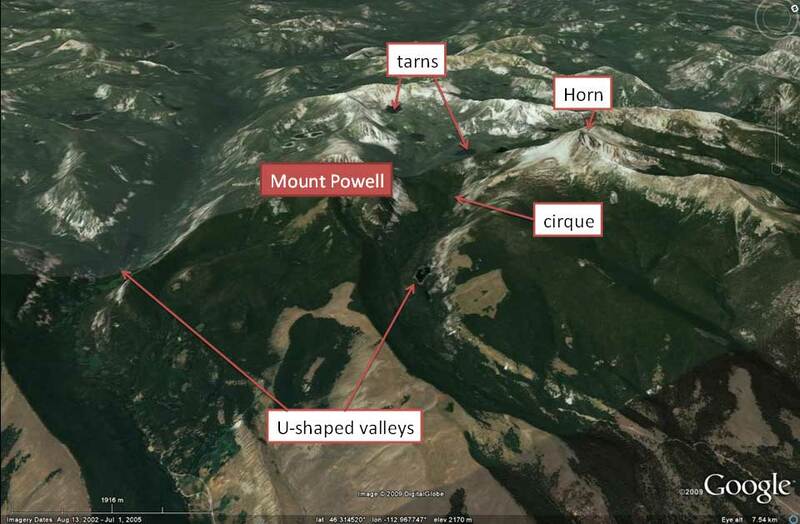 The three-sided peaks between cirques are called horns. Tarns are the lakes left in the bottoms of cirques. 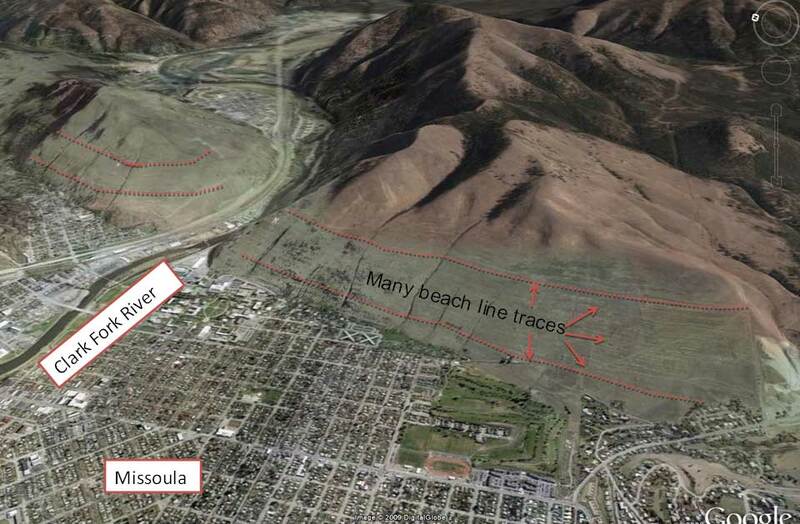 Glacial Lake Missoula: The horizontal lines on Mount Sentinel and Mount Jumbo in Missoula represent beach lines of lakes that repeatedly filled the valley to over 900 feet deep. The lakes were formed when glaciers blocked the Clark Fork River, and flooding occured when ice dams failed. 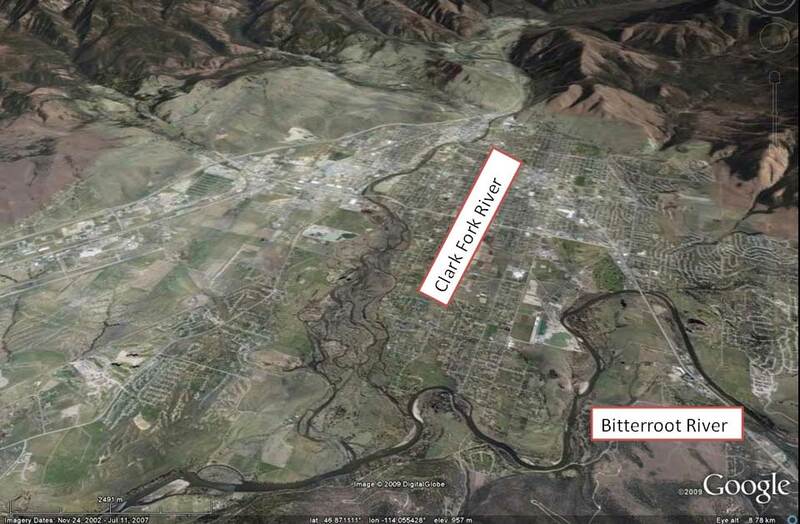 Clark Fork-Bitterroot Junction: Where the Clark Fork River enters the Missoula Valley, it percolates into a deep basin of porous river gravel, and much of its current is lost. Where the river slows down, it meanders more widely, here forming a delta-like fan where it enters the Bitterroot River. 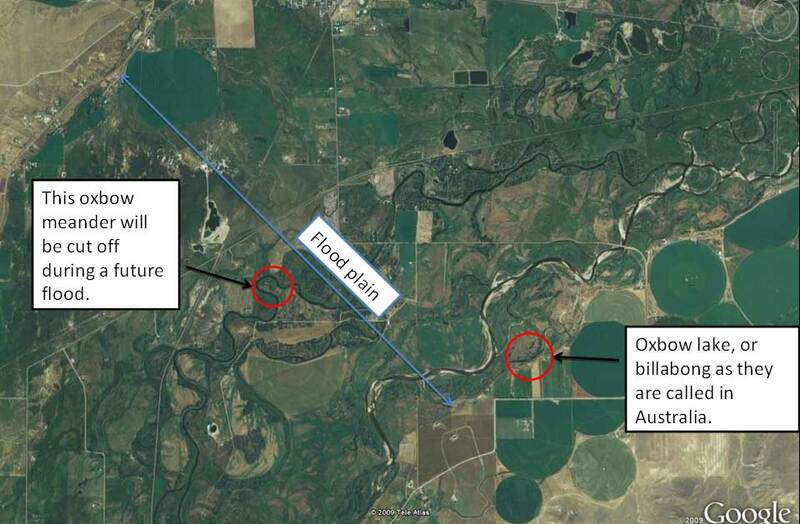 In this view, look for oxbow ponds (areas where U-shaped bends in the river existed, but were cut-off from the mainstem) and abandoned meanders. Alluvial Fan Near Ennis: This broad, fan-shaped mound of sand and gravel formed where Cedar Creek flows from the mountains into the flood plain of the Madison River. Alluvial fans form where fast flowing streams lose their velocity upon entering a flat plain. Jefferson River Floodplain Near Whitehall: Here the slow-moving Jefferson River flows across a broad floodplain. 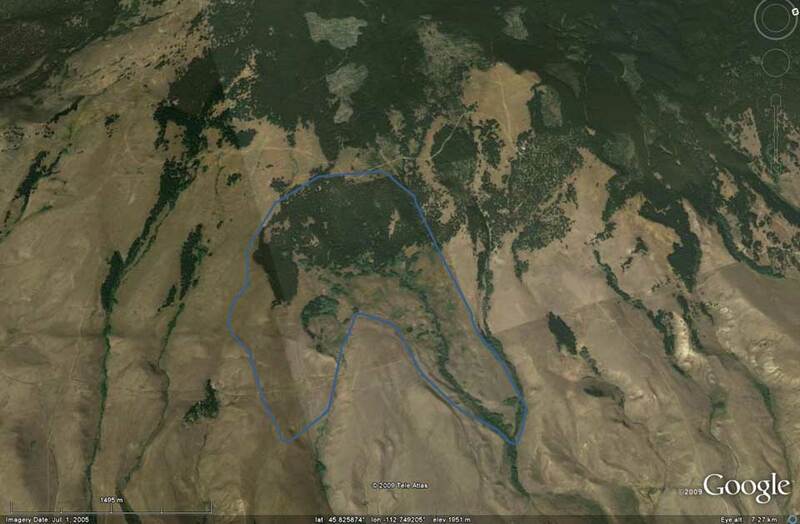 You can see abandoned meanders and oxbow lakes that show past paths of the river. 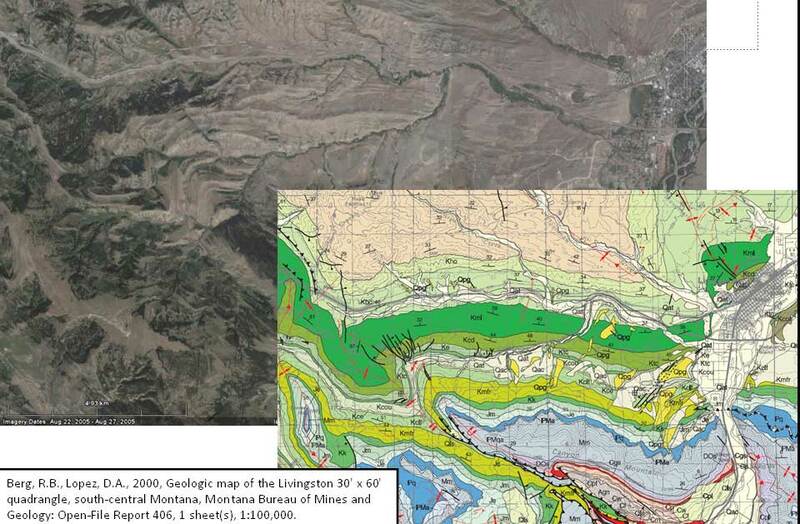 Georgia Gulch Fault, Sheridan-Twin Bridges: The sharp north-south line in the middle of this view is a fault scarp that cuts an alluvial fan at the mouth of Goodrich Gulch. 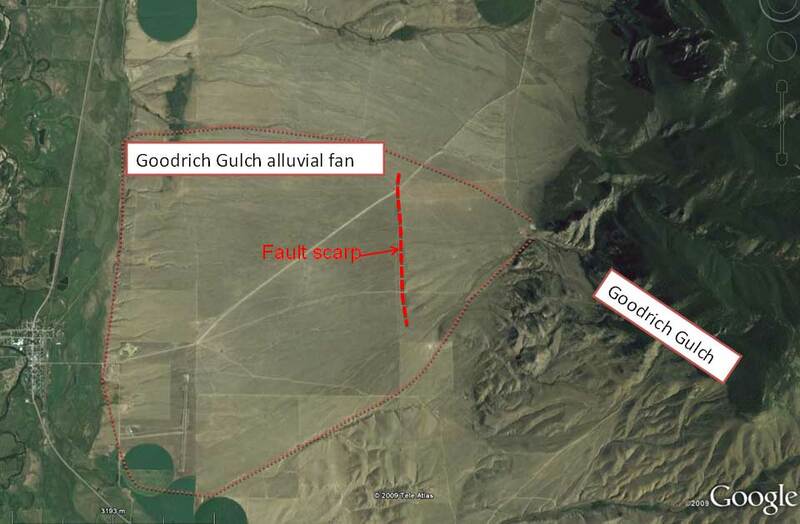 This is part of the larger Georgia Gulch Fault, which has moved during the last 15,000 years, which is geologically very recent. 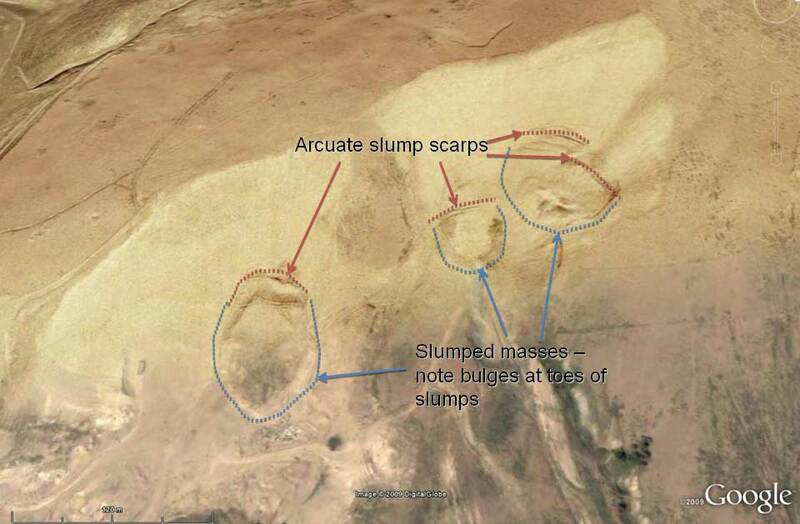 Anaconda Landslides: These crescent-shaped cracks form at the top of slumped rock and/or soil masses. This hillside just east of the Old Works has been repaired repeatedly, but new slides form every year. The hill is underlain by volcanic ashes that have altered to clays which lose their strength easily — especially when wet. 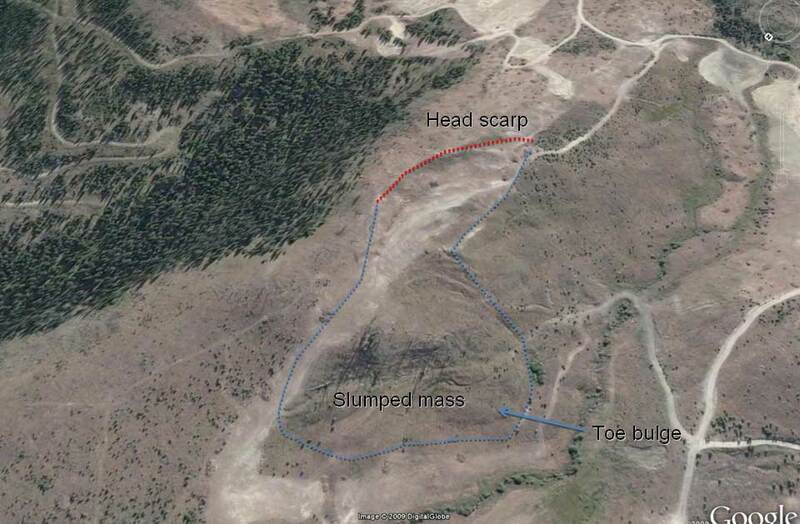 Big Sky Landslide: Crescent-shaped scarps mark the top of a large sediment slump on a hillside near Big Sky. Fan Mountain Rock Glacier, Ennis Area: This mass of talus is cored with ice, which holds it together as a coherent body. This is called a rock glacier, and it flows down hill, much like an ice glacier. Bedrock Ridges Near Livingston: Here, the landscape is controlled by folded bedrock layers which are clearly visible from the air. The well-treed ridges are limestone, which conifers seem to prefer to other rock types. 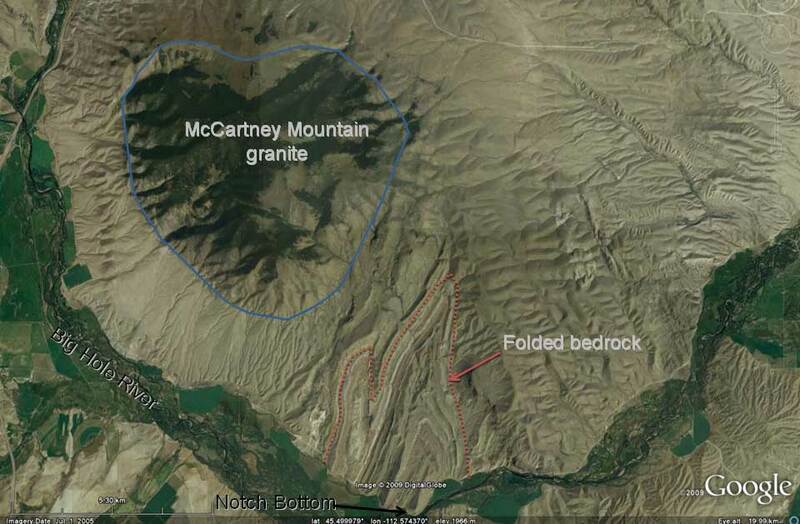 McCartney Mountain: From the air you can see that the landscape is controlled by a round granite body and folded bedrock layers. The trees prefer to grow on the granite, which is just left of center in this view. The folded bedrock layers in the lower center of this view are spectacularly exposed, and geology students from all over North America come here to improve their mapping skills. The prominent whitish layer is limestone. 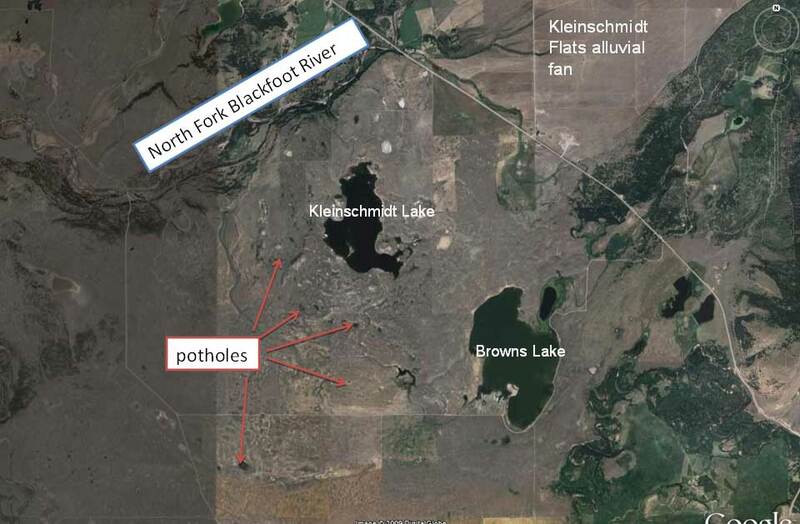 Kleinschmidt Lakes: These large and small potholes date back to the end of the last glaciation. Potholes form where ice blocks buried in glacial till melted over a period of hundreds or thousands of years. The potholes are the cavities left by the ice blocks. Glacial Valleys Near Lincoln: These U-shaped valleys and knife-edge ridges, or aretes, were carved by thick, slow-moving glaciers during the last glacial period about 18,000 years ago. 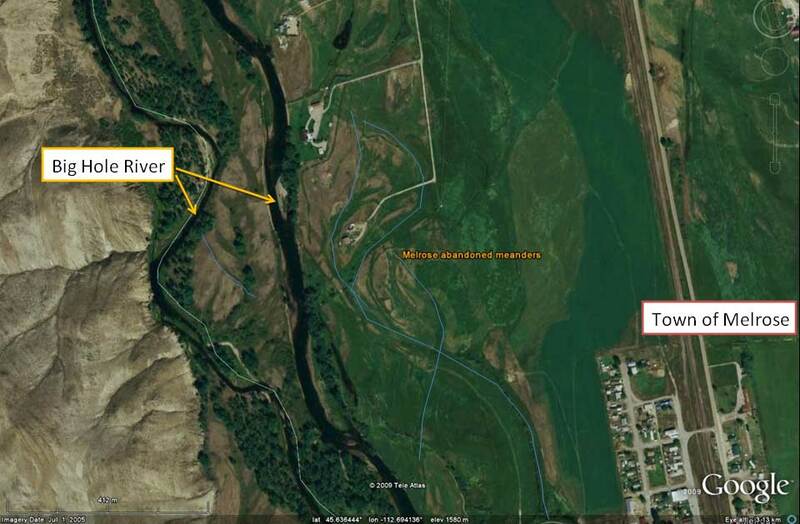 Stream Features Near Grant: This view shows the alluvial fan where Barrett Creek enters the flood plain of Horse Prairie Creek. Horse Prairie Creek is much too small to have created this broad braided flood plain, suggesting that that there was once a much bigger river flowing here. 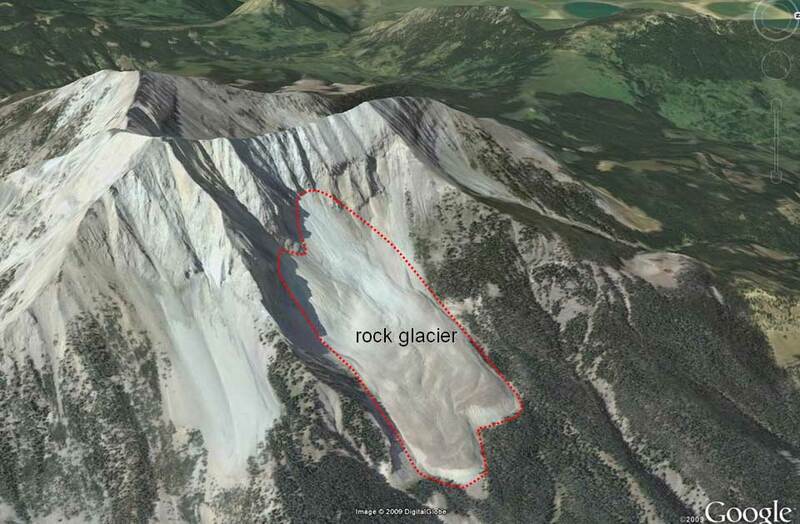 Perhaps the high water came from melting glaciers in the Beaverhead Range. 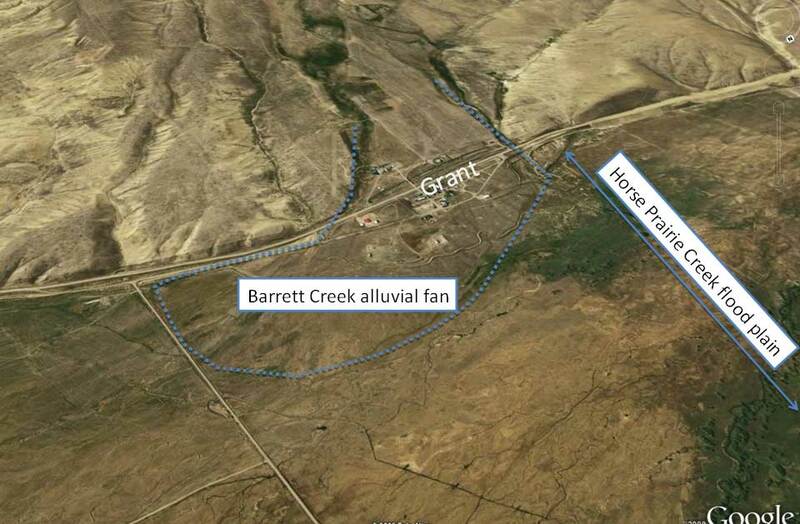 The Barrett Creek alluvial fan has formed on top of the braided flood plain, suggesting that it formed after Horse Prairie Creek started to dwindle in size.